Breevy is a text expander for Windows that helps you type faster and more accurately by allowing you to abbreviate long words and phrases – saving you time and money. 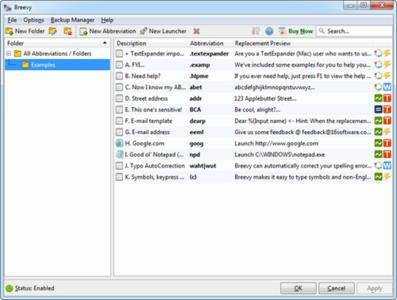 Simply define an abbreviation for a longer piece of text, like eml for JohnDoeatemail.com. Then, in the future, instead of typing that longer piece of text, type the abbreviation you associated with that text in any application, and Breevy will automatically replace it for you, instantly. Think of how much time you'll save!